Lerato Tshabalala first came to our attention in 2011 with her 'Urban Miss' column in the Sunday Times, and since then she has by turns entertained, exasperated, amused and confounded her fans and critics alike.Now, with her first book, she looks set to become the national institution she deserves to be. With her customary wit and keen insight into social, political and cultural affairs, Lerato shines a bright - and controversial - light on South African society and the quirky ways of the country. She is brutally honest about her experiences as a black South African in post-apartheid Mzansi, and no subject is too sacred for her to explore: annoying car guards, white-dominated corporate South Africa, cultural stereotypes, economic and racial inequality, and gender politics, among many other topics, come under her careful - and often laugh-out-loud - scrutiny. 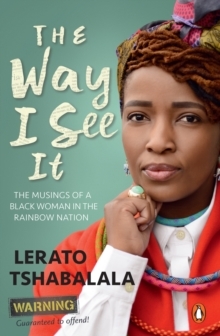 The Way I See It is written for people who are hungry for a book that is thought-provoking, funny, irreverent and truly South African all at the same time. It is light but full of depth: like a supermodel with an MBA!